How do I make a link to a Resource folder appear in the tool panel? 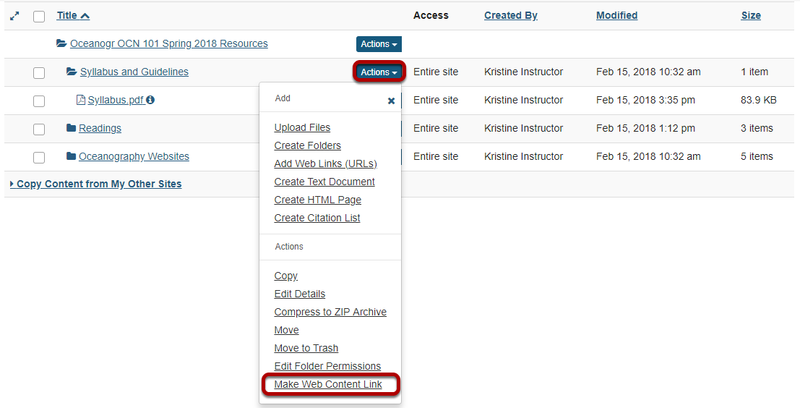 Sakai Community DocumentationSakai 19 User Guide (English) ResourcesHow do I make a link to a Resources folder appear in the Tool Menu? Zoom: Click Actions, then Make Web Content Link. Enter a title, then Add. Enter a title for the page link, then click Add. Zoom: View folder link in Tool Menu.